What happens when the Car Starts? 11.5V x 300 Amps = 3450 watts. When we convert this power into Horse Power (HP) we get 4.62 HP (used online calculator). So to start a car normally, around 4 HP power is necessary and for that, the battery should deliver 300 Amps current and its terminal voltage should not drop less than 11 V.
9 V x 200 Amps= 1800 watts. So its Horse Power is 2.41 HP. That means, the power is only 50% than the required power to start the car. Car will not start and the engine crank with a sound only. How this happens in a Flat battery? When the battery is aged or kept for long time without charging, “Self discharge” takes place. This is due to the difference in potential between the top and bottom of the battery cells. Similarly, the specific gravity of the Electrolyte (Sulphuric acid) also differs in the top and bottom. This results in the flow of an internal current through the battery and self discharge takes place. 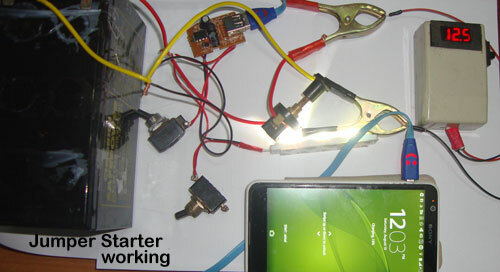 As a result of this self discharge, the battery voltage drops considerably below 9V when we attempt to start the car. The battery fails to deliver high current because the electrolyte is not capable to carry high current and a potential develops across the electrolyte. So what the Jump starter do? The Jump starter has a new 12 volt battery. It is the “Booster battery”. Its Ah can be between 7 Ah to 20 Ah. 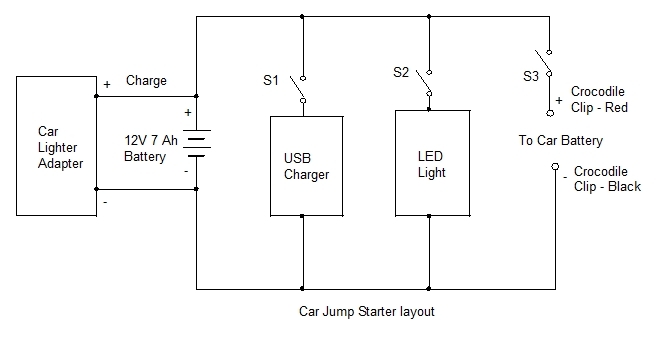 When it is connected to the flat battery of the car, the terminal voltage of the flat battery increases to 12.6V within 2-5 minutes. This is due to the transfer of charge from the Booster battery of the Jump starter to the Flat battery. The Booster battery gives few Amps current for this. When this happens, the efficiency of the electrolyte in the flat battery increases considerably and the terminal voltage of the flat battery increases to 12.6V or more quickly. So this increase in the terminal voltage is the secret of the Jumper starting. When the terminal voltage increases, the flat battery delivers around 200 Amps and the booster battery in the Jump starter gives around 100 Amps. So this combination gives 300 Amps for the quick starting. The voltage of the Booster battery must be 12V to match with the Car battery. But its capacity can be between 7 Ah to 20 Ah or higher. The booster battery delivers only a some power to the flat battery. So its Ah will not affect considerably. A 12V 7 Ah UPS battery is ideal. If you feel weight in the Jump starter unit, use a Lithium ion battery rated 12V, 12,000 mAh to 30,000 mAh. Then the unit becomes light weight and portable. But the cost will increase considerably. Then why we include other facilities like Mobile charger, LED lights etc. Actually a Booster battery is sufficient in the Jump starter to do the job. But if it is so, sometimes we forget to charge the Jump starter battery because its use comes only in a rare situation. We have to keep it in top condition always to do its job in emergency. So additional facilities like Mobile charger and LED light etc are added. Then we will always handle the unit and charge it properly. Now let us make one Jump starter unit. 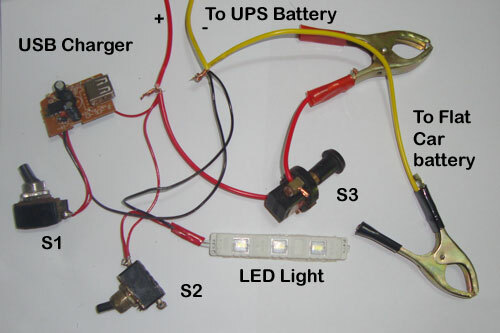 All the positive and negative connections of the Mobile charger, LED light, Car lighter adapter should go to the Positive and Negative terminals of the battery. But each should have a separate switch in the Positive line to use separately. Connect a high gauge Red wire with switch in the Positive terminal of the battery. Connect a Crocodile clip at the other end of the wire. Similarly connect a Black wire in the negative of battery and a Crocodile clip at the other end of wire. Now the Clips to connect with the flat car battery are ready. 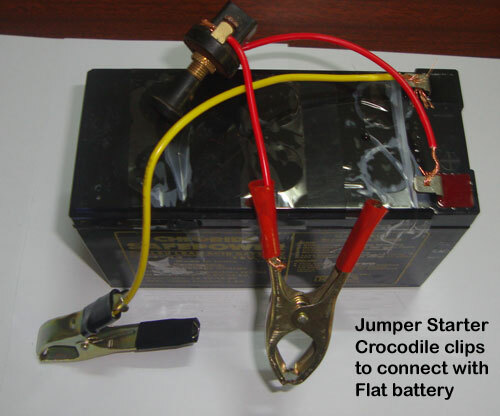 When we connect the Crocodile clips to the flat battery with correct polarity and switch turns on, current from the Jump start battery flows into the flat car battery. Switches are very important because all are directly connected to the battery. Otherwise short circuit occurs when the crocodile clips accidentally touches when not in use. 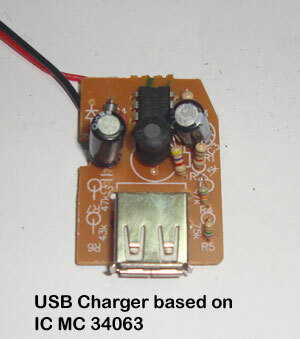 You can purchase a USB charger Module based on the IC MC 34063. It is a Switch mode regulator IC that produces very little heat during its operation. We can use a 7805 Voltage regulator to convert 12V to 5V for Mobile charging. But the 7805 dissipates too much heat in high current. So it damages easily if the heat sink is not so efficient. Moreover, the current cannot be regulated and it will be around 1 Amps. 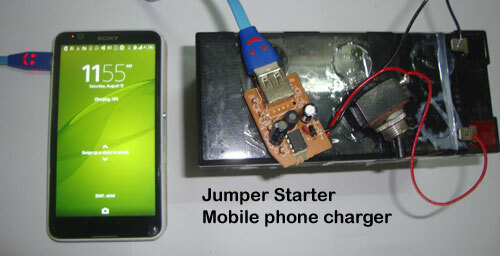 But the USB charger module restricts both voltage and current for Mobile charging. The output current from the USB charger module will be 5V at 500 mA. You can charge all USB devices that require 5V from this USB socket. If you don’t have a Module, construct one using the diagram given below. Enclose the battery inside the case. Make holes in the case for three switches and the USB socket of the Module. Drill holes in the back cover to takes wires for the Car lighter adapter and the Crocodile clips. Now the unit is ready. Keep this in your car. Charge once in two days by connecting the Lighter adapter in your Car lighter socket. You can also charge externally from a 12V 1 Amps power supply. 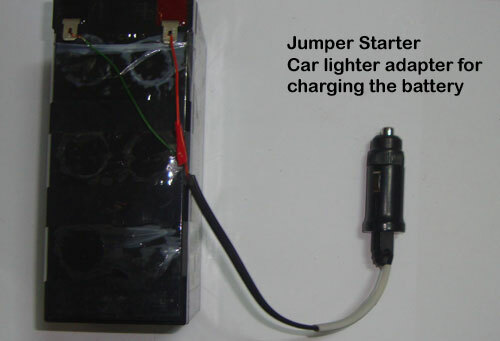 For this , use mini alligator clips to connect with the positive and negative contacts of the Lighter adapter. The LED light in the unit helps to check the interior of bonnet and tyres during night. 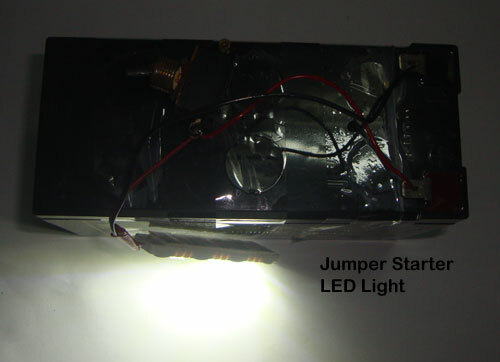 In home, the unit becomes an LED emergency light, USB charger and a 12 volt power supply to drive some gadgets. Remember; keep the battery always in top condition through both charge and discharge cycles. Use regularly and charge regularly. Then only the battery remains always in top condition. If properly maintained, the battery lasts more than 4 years. Its cost range between Rs.600 and Rs. 800.